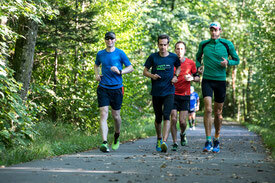 As usual in Ultratriathlon races, the disciplines will be accomplished in rather short laps. 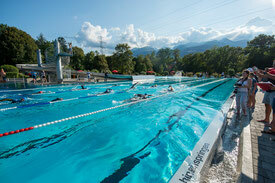 The swim split will take place in the outdoor swimming pool of Buchs (50 meter laps). The average temperature of the water in August is between 21 and 24ºC. The bike course is generally flat and leads from the pool area to the Rhine dam, along the river Rhine to the village of Sevelen and back to the pool (9 km laps). The run course leads around the swimming pool area through the woods (1.25 km laps).